The Wounded Knee Massacre occurred on December 29, 1890, near Wounded Knee Creek (Lakota: Čhaŋkpé Ópi Wakpála) on the Lakota Pine Ridge Indian Reservation in South Dakota, USA. It was the last battle of the American Indian Wars. On the day before, a detachment of the U.S. 7th Cavalry Regiment commanded by Major Samuel M. Whitside intercepted Spotted Elk's band of Miniconjou Lakota and 38 Hunkpapa Lakota near Porcupine Butte and escorted them five miles westward (8 km) to Wounded Knee Creek, where they made camp. The remainder of the 7th Cavalry Regiment arrived, led by Colonel James W. Forsyth and surrounded the encampment supported by four Hotchkiss guns. On the morning of December 29, the troops went into the camp to disarm the Lakota. One version of events claims that during the process of disarming the Lakota, a deaf tribesman named Black Coyote was reluctant to give up his rifle, claiming he had paid a lot for it. A scuffle over Black Coyote's rifle escalated and a shot was fired which resulted in the 7th Cavalry's opening fire indiscriminately from all sides, killing men, women, and children, as well as some of their own fellow soldiers. Those few Lakota warriors who still had weapons began shooting back at the attacking soldiers, who quickly suppressed the Lakota fire. The surviving Lakota fled, but U.S. cavalrymen pursued and killed many who were unarmed. By the time it was over, at least 150 men, women, and children of the Lakota had been killed and 51 wounded (4 men, 47 women and children, some of whom died later); some estimates placed the number of dead at 300. Twenty-five soldiers also died, and 39 were wounded (6 of the wounded would later die). It is believed that many were the victims of friendly fire, as the shooting took place at close range in chaotic conditions. At least twenty soldiers were awarded the Medal of Honor. In the years prior to the massacre, the U.S. Government had continued to seize the Lakota's lands. The once large bison herds (an indigenous peoples' Great Plains staple), had been hunted to near-extinction by European settlers. Treaty promises  to protect reservation lands from encroachment by settlers and gold miners were not implemented as dictated by treaty. As a result, there was unrest on the reservations. It was during this time that news spread among the reservations of a Paiute prophet named Wovoka, founder of the Ghost Dance religion. He had a vision that the Christian Messiah, Jesus Christ, had returned to earth in the form of a Native American. The Messiah would raise all the Native American believers above the earth. During this time the white man would disappear from Native lands, the buffalo herds and all the other animals would return in abundance, and the ghosts of their ancestors would return to earth — hence the word "Ghost" in "Ghost Dance". They would then return to earth to live in peace. All this would be brought about by performance of the "Ghost Dance". Lakota ambassadors to Wovoka, Kicking Bear and Short Bull taught the Lakota that while performing the Ghost Dance, they would wear special Ghost Dance shirts as seen by Black Elk in a vision. Kicking Bear said the shirts had the power to repel bullets. "As for the "Ghost Dance" too much attention has been paid to it. It was only the symptom or surface indication of a deep rooted, long existing difficulty; as well treat the eruption of small pox as the disease and ignore the constitutional disease." "The difficult Indian problem cannot be solved permanently at this end of the line. It requires the fulfillment of Congress of the treaty obligations that the Indians were entreated and coerced into signing. They signed away a valuable portion of their reservation, and it is now occupied by white people, for which they have received nothing." "They understood that ample provision would be made for their support; instead, their supplies have been reduced, and much of the time they have been living on half and two-thirds rations. Their crops, as well as the crops of the white people, for two years have been almost total failures." "The dissatisfaction is wide spread, especially among the Sioux, while the Cheyennes have been on the verge of starvation, and were forced to commit depredations to sustain life. These facts are beyond question, and the evidence is positive and sustained by thousands of witnesses." On December 28, 1890, Chief Spotted Elk of the Miniconjou Lakota nation and 350 of his followers were intercepted by a 7th Cavalry detachment under Major Samuel M. Whitside southwest of the badlands near Porcupine Butte. John Shangreau, a scout and interpreter who was half Sioux, advised that they not be disarmed immediately, as it would lead to violence. The troopers escorted the Lakota about five miles westward (8 km) to Wounded Knee Creek where they made camp. Later that evening, Col. James W. Forsyth and the rest of the 7th Cavalry arrived, bringing the number of troopers at Wounded Knee to 500. In contrast, there were 350 Native Americans, of whom all but 120 were women and children. The troopers surrounded Spotted Elk's encampment and set up four rapid fire Hotchkiss-designed M1875 Mountain Guns. At daybreak on December 29, 1890, Col. Forsyth ordered the surrender of weapons and the immediate removal and transportation of the Indians from the "zone of military operations" to awaiting trains. A search of the camp confiscated 38 rifles and more rifles were taken as the soldiers searched the Indians. None of the old men were found to be armed. Yellow Bird harangued the young men who were becoming agitated by the search and the tension spread to the soldiers. Specific details of what triggered the fight are debated. According to some accounts, a medicine man named Yellow Bird began to perform the Ghost Dance, reiterating his assertion to the Lakota that the ghost shirts were bulletproof. As tension mounted, Black Coyote refused to give up his rifle; he was deaf and had not understood the order. Another Indian said: "Black Coyote is deaf." (He did not speak English). When the soldier refused to heed his warning, he said, "Stop! He cannot hear your orders!" At that moment, two soldiers seized Black Coyote from behind, and in the struggle (allegedly), his rifle discharged. At the same moment Yellow Bird threw some dust into the air, and approximately five young Lakota men with concealed weapons threw aside their blankets and fired their rifles at Troop K of the 7th. After this initial exchange, the firing became indiscriminate. Soldiers pose with three of the four Hotchkiss-designed M1875 Mountain Guns used at Wounded Knee. The caption on the photograph reads: "Famous Battery 'E' of the 1st Artillery. These brave men and the Hotchkiss guns that Big Foot's Indians thought were toys, Together with the fighting 7th what's left of Gen. Custer's boys, Sent 200 Indians to that Heaven which the ghost dancer enjoys. This checked the Indian noise, and Gen. Miles with staff Returned to Illinois." According to commanding Gen. Nelson A. Miles, a "scuffle occurred between one warrior who had [a] rifle in his hand and two soldiers. 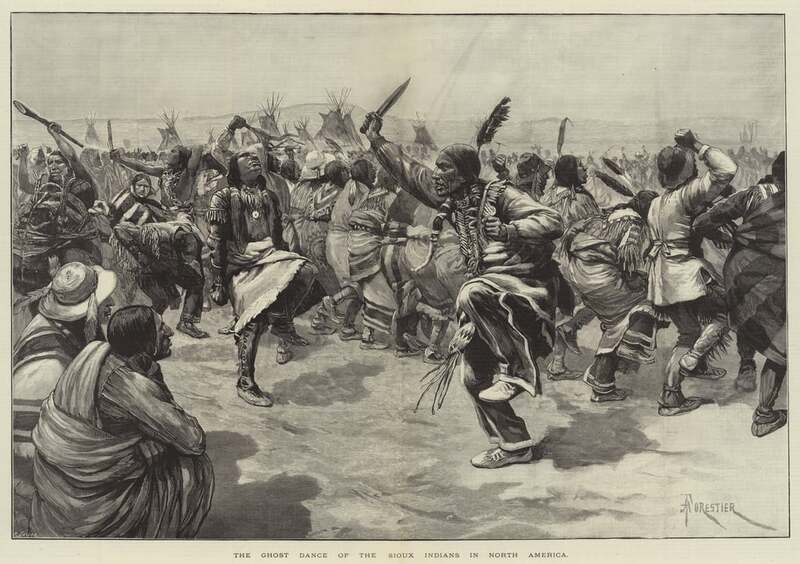 The rifle was discharged and a battle occurred, not only the warriors but the sick Chief Spotted Elk, and a large number of women and children who tried to escape by running and scattering over the prairie were hunted down and killed." At first the struggle was fought at close range; fully half the Indian men were killed or wounded before they had a chance to get off any shots. Some of the Indians grabbed rifles they had been hiding and opened fire on the soldiers. With no cover, and with many of the Lakota unarmed, this phase of the fighting lasted a few minutes at most. While the Indian warriors and soldiers were shooting at close range, other soldiers used the Hotchkiss guns against the tipi camp full of women and children. It is believed that many of the troops on the battlefield were victims of friendly fire from their own Hotchkiss guns. The Indian women and children fled the camp, seeking shelter in a nearby ravine from the crossfire. The officers had lost all control of their men. Some of the soldiers fanned out to run across the battlefield and finished off wounded Indians. Others leaped onto their horses and pursued the Lakota (men, women and children), in some cases for miles across the prairies. By the end of the fighting, which lasted less than an hour, at least 150 Lakota had been killed and 50 wounded. Historian Dee Brown, in Bury My Heart at Wounded Knee, mentions an estimate of 300 of the original 350 having been killed or wounded and that the soldiers loaded 51 survivors (4 men and 47 women and children) of the massacre onto wagons and took them to the Pine Ridge Reservation. Army casualties numbered 25 dead and 39 wounded. "... then many Indians broke into the ravine; some ran up the ravine and to favorable positions for defense." "I did not know then how much was ended. When I look back now from this high hill of my old age, I can still see the butchered women and children lying heaped and scattered all along the crooked gulch as plain as when I saw them with eyes young. And I can see that something else died there in the bloody mud, and was buried in the blizzard. A people's dream died there. It was a beautiful dream ... the nation's hope is broken and scattered. There is no center any longer, and the sacred tree is dead." "There was a woman with an infant in her arms who was killed as she almost touched the flag of truce ... A mother was shot down with her infant; the child not knowing that its mother was dead was still nursing ... The women as they were fleeing with their babies were killed together, shot right through ... and after most all of them had been killed a cry was made that all those who were not killed or wounded should come forth and they would be safe. Little boys ... came out of their places of refuge, and as soon as they came in sight a number of soldiers surrounded them and butchered them there." View of canyon at Wounded Knee, dead horses and Lakota bodies are visible. Following a three-day blizzard, the military hired civilians to bury the dead Lakota. The burial party found the deceased frozen; they were gathered up and placed in a mass grave on a hill overlooking the encampment from which some of the fire from the Hotchkiss guns originated. It was reported that four infants were found alive, wrapped in their deceased mothers' shawls. In all, 84 men, 44 women, and 18 children reportedly died on the field, while at least seven Lakota were mortally wounded. General Nelson Miles denounced Colonel Forsyth and relieved him of command. An exhaustive Army Court of Inquiry convened by Miles criticized Forsyth for his tactical dispositions, but otherwise exonerated him of responsibility. The Court of Inquiry, however, was not conducted as a formal court-martial. 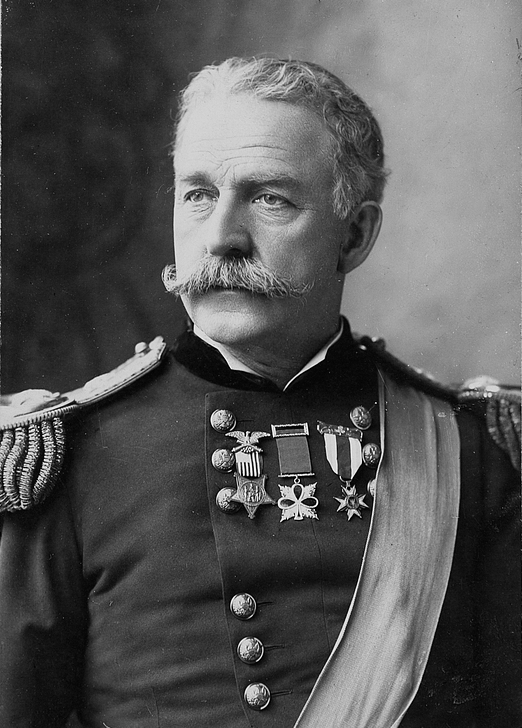 The Secretary of War concurred with the decision and reinstated Forsyth to command of the 7th Cavalry. Testimony had indicated that for the most part, troops attempted to avoid non-combatant casualties. Miles continued to criticize Forsyth, whom he believed had deliberately disobeyed his commands in order to destroy the Indians. 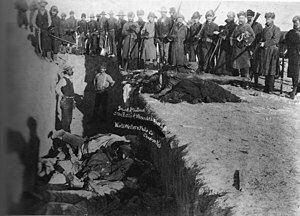 Miles promoted the conclusion that Wounded Knee was a deliberate massacre rather than a tragedy caused by poor decisions, in an effort to destroy the career of Forsyth. This was later whitewashed and Forsyth was promoted to Major General. Soon after the event, Dewey Beard, his brother Joseph Horn Cloud and others formed the Wounded Knee Survivors Association, which came to include descendants. They sought compensation from the US government for the many fatalities and injured. Today the association is independent and works to preserve and protect the historic site from exploitation, and to administer any memorial erected there. Papers of the association (1890–1973) and related materials are held by the University of South Dakota and are available for research. It was not until the 1990s that a memorial to the Lakota was included in the National Historic Landmark. More than 80 years after the battle, beginning on February 27, 1973, Wounded Knee was the site of the Wounded Knee incident, a 71-day standoff between militants of the American Indian Movement—who had chosen the site for its symbolic value—and federal law enforcement officials. The 'Bloody Pocket'; location of the Drexel Mission Fight. The Drexel Mission Fight was an armed confrontation between Lakota warriors and the United States Army that took place on the Pine Ridge Indian Reservation the day after the battle on December 30, 1890. The fight occurred on White Clay Creek approximately 15 miles north of Pine Ridge where Lakota fleeing from the continued hostile situation surrounding the battle at Wounded Knee had set up camp. Company K of the Seventh Cavalry — the unit involved in the battle — was sent to force the Lakotas' return to the areas they were assigned on their respective reservations. Some of the 'hostiles' were Brulé Lakota from the Rosebud Indian Reservation. The Seventh Cavalry was pinned down in a valley by the combined Lakota forces and had to be rescued by the Ninth Cavalry, an African American regiment nicknamed the Buffalo Soldiers. For this 1890 offensive, the Army awarded twenty Medals of Honor, its highest commendation. While recently, in the governmental Nebraska State Historical Society's Summer 1994 quarterly journal, Jerry Green construes that, pre-1916 Medals of Honor were awarded more liberally, however "the number of medals does seem disproportionate when compared to those awarded for other battles." Quantifying, he compares the three awarded for the Battle of Bear Paw Mountain's five-day siege, to the twenty awarded for this short and one-sided action. Native American activists have urged the medals be withdrawn, as they say they were "Medals of Dishonor". According to Lakota tribesman William Thunder Hawk, "The Medal of Honor is meant to reward soldiers who act heroically. But at Wounded Knee, they didn't show heroism; they showed cruelty." In 2001, the National Congress of American Indians passed two resolutions condemning the Medals of Honor awards and called on the U.S. government to rescind them. Historian Will G. Robinson noted that, in contrast, only three Medals of Honor were awarded among the 64,000 South Dakotans who fought for four years of World War II. GRESHAM, JOHN C. Rank and organization: First Lieutenant, 7th U.S. Cavalry. Place and date: At Wounded Knee Creek, S. Dak., 29 December 1890. Entered service at: Lancaster Courthouse, Va. Birth: Virginia. Date of issue: 26 March 1895. Citation: Voluntarily led a party into a ravine to dislodge Sioux Indians concealed therein. He was wounded during this action. SULLIVAN, THOMAS Rank and organization: Private, Company E, 7th U.S. Cavalry. Place and date: At Wounded Knee Creek, S. Dak., 29 December 1890. Entered service at: Newark, N.J. Birth: Ireland. Date of issue: 17 December 1891. Citation: Conspicuous bravery in action against Indians concealed in a ravine. Wounded Knee hill, location of Hotchkiss guns during battle and subsequent mass grave of Native American Dead. "This monument is erected by surviving relatives and other Ogalala and Cheyenne River Sioux Indians in memory of the Chief Big Foot massacre December 29, 1890. Col. Forsyth in command of US troops. Big Foot was a great chief of the Sioux Indians. He often said, 'I will stand in peace till my last day comes.' He did many good and brave deeds for the white man and the red man. Many innocent women and children who knew no wrong died here." Beginning in 1986, a group began the Big Foot Memorial Riders to continue to honor the dead. The ceremony has attracted more participants each year and riders live with the cold weather, as well as the lack of food and water, as they retrace the path that their family members took to Wounded Knee. They carry with them a white flag to symbolize their hope for world peace, and to honor and remember the victims so that they will not be forgotten. In his 1931 poem "American Names", Stephen Vincent Benet coined the phrase "Bury my heart at Wounded Knee". The poem is about his love of American place names, not making reference to the 'battle'. However, when the line was used as the title of historian Dee Brown's 1970 best-selling book, awareness was raised and Benet's phrase became popularly associated with the incident, especially in music. After the book, "Bury my heart at Wounded Knee" was used many times in reference to the battle, especially in music. In 1973, Stuttgart, Germany's Gila released a krautrock/psych folk album by the name. In 1992, Beverly (Buffy) Sainte-Marie released her song entitled "Bury My Heart at Wounded Knee", on her Coincidence and Likely Stories album. Other artists who have written or recorded songs referring to the battle at Wounded Knee include: Walela "Wounded Knee" from their 1997 self-titled album. Nightwish ("Creek Mary's Blood" from their 2004 album "Once" featuring John Two-Hawks); Manowar ("Spirit Horse Of The Cherokee" from the 1992 album The Triumph Of Steel ); Grant Lee Buffalo ("Were You There?" from the album Storm Hymnal 2001); Johnny Cash (1972's "Big Foot," which is strongly sympathetic); The Indigo Girls (a cover of Sainte-Marie's song); Charlie Parr ("1890" on his 2010 album When the Devil Goes Blind); Nik Kershaw ("Wounded Knee" on his 1989 album The Works); Southern Death Cult ("Moya"); The Waterboys ("Bury My Heart"); Uriah Heep; Primus; Patti Smith; Robbie Robertson; Five Iron Frenzy wrote the 2001 song "The Day We Killed" with mentions of Custard, Black Kettle, and quotes Black Elk's account from Black Elk Speaks on their album Five Iron Frenzy 2: Electric Boogaloo; Toad the Wet Sprocket; Marty Stuart; Bright Eyes; and "Pocahontas" by Neil Young. On Sam Roberts' 2006 Chemical City album, the song "The Bootleg Saint" contains line critical of the Wounded Knee Massacre. In 1973, the American rock band Redbone, formed by Native Americans Patrick and Lolly Vasquez, released the song, "We Were All Wounded at Wounded Knee". The song ends with the subtly altered sentence, "We were all wounded by Wounded Knee." The song reached the number-one chart position across Europe. In the U.S., the song was initially withheld from release and then banned by several radio stations. The battle is referenced in films such as Thunderheart (1992) and Hidalgo (2004). The 2005 film Into the West included scenes of the battle. In 2007, HBO Films released a film adaptation of the Dee Brown bestseller Bury My Heart at Wounded Knee. In the 1996 DC comic book Saint of Killers, written by Garth Ennis, the main character becomes a surrogate Angel of Death, reaping souls whenever men kill other men violently. The story is set in the 1880s and, near the end of chapter 4, it is said that "four years later" he was called upon at Wounded Knee. In the 2013 video game BioShock Infinite, several main characters are veterans of Wounded Knee. The protagonist Booker DeWitt is haunted by his deeds during the battle and plunges into depression and gambling addiction as a result. Cpt. Allyn K. Capron, Jr. The scene three weeks afterwards, with several bodies partially wrapped in blankets in the foreground. Buffalo Bill, Capt. Baldwin, Gen. Nelson A. Miles, Capt. Moss, and others, on horseback, on battlefield of Wounded Knee. Reenactment of U.S. troops surrounding the Lakota at Wounded Knee (1913). Gen. L. W. Colby holding Zintkala Nuni (Little Lost Bird), found on the Wounded Knee battlefield. ↑ Brown, p. 178, Brown states that at the army camp, "the Indians were carefully counted." Utley, p. 204, gives 120 men 230 women and children; there is no indication how many were warriors, old men, or incapacitated sick like Big Foot. ↑ Nelson A. Miles to the Commissioner of Indian Affairs, March 13, 1917, "The official reports make the number killed 90 warriors and approximately 200 women and children." ↑ 4.0 4.1 "National Historic Landmarks Program: Wounded Knee". National Park Service. http://tps.cr.nps.gov/nhl/detail.cfm?ResourceId=540&ResourceType=Site. Retrieved 2008-01-10. ↑ Liggett, Lorie (1998). "Wounded Knee Massacre - An Introduction". Bowling Green State University. http://www.bgsu.edu/departments/acs/1890s/woundedknee/WKIntro.html. Retrieved 2007-03-02..
↑ Randy Parsons. "The Wounded Knee Massacre - December 1890". Lastoftheindependents.com. http://www.lastoftheindependents.com/wounded.htm. Retrieved 2011-08-17. ↑ 8.0 8.1 8.2 Green, Jerry (1994). "The Medals of Wounded Knee". Nebraska State Historical Society History. http://nebraskahistory.org/publish/publicat/history/full-text/NH1994MedalsWKnee.pdf. ↑ To this day the Sioux have refused to accept compensation for the Black Hills land seized from them. A 1980 Supreme Court decision (United States v. Sioux Nation of Indians) ruled the taking was illegal and awarded compensation, increased by interest to $757 million dollars, but not the return of the land which the Sioux sought. The Lakota have refused to take the money, demanding, instead, the return of the land. ↑ Viola, Herman J. Trail to Wounded Knee: The Last Stand of the Plains Indians 1860–1890. Washington, D.C.: National Geographic Society, 2003. ↑ Russell, Major Samuel L., "Selfless Service: The Cavalry Career of Brigadier General Samuel M. Whitside from 1858 to 1902." MMAS Thesis, Fort Leavenworth: U.S. Command and General Staff College, 2002. ↑ Axelrod, Alan. (1993) Chronicles of the Indian Wars: From Colonial Times to Wounded Knee. (p. 254). ↑ Utley, Robert (1963). "The Last Days of the Sioux Nation". Yale University Press. http://yalepress.yale.edu/yupbooks/book.asp?isbn=9780300103168. Retrieved 2007-08-04. ↑ Phillips, Charles. December 29, 1890. American History. Dec 2005 40(5) pp. 16–68. ↑ Bateman, Robert (June 2008). "Wounded Knee". pp. 62–67. ↑ Derived from Nelson Miles' report of some 300 snow covered forms during his inspection of the field 3 days later, Miles in a letter states: "The official reports make the number killed 90 warriors and approximately 200 women and children.". ↑ Black Elk, John Gneisenau Neihardt (October 16, 2008). Black Elk Speaks. books.google.com. http://books.google.com/books?id=7p9VqRLiKqcC&pg=PA218&lpg=PA218&dq=I+did+not+know+then+how+much+was+ended.+When+I+look+back+now+from+this+high+hill+of+my+old+age,+I+can+still+see+the+butchered+women+and+children+lying+heaped+and+scattered+all+along+the+crooked+gulch+as+plain+as+when+I+saw+them+with+eyes+young.&source=bl&ots=qpgAPTFxdt&sig=YvZIkqXS8KTrNdW3UMsTjohxI34&hl=en&sa=X&ei=eCtaUarkCIKUywHayYGYAg&ved=0CEMQ6AEwAg#v=onepage&q=I%20did%20not%20know%20then%20how%20much%20was%20ended.%20When%20I%20look%20back%20now%20from%20this%20high%20hill%20of%20my%20old%20age%2C%20I%20can%20still%20see%20the%20butchered%20women%20and%20children%20lying%20heaped%20and%20scattered%20all%20along%20the%20crooked%20gulch%20as%20plain%20as%20when%20I%20saw%20them%20with%20eyes%20young.&f=false. ↑ "Lakota Accounts of the Massacre at Wounded Knee". pbs.org. 2000. http://www.pbs.org/weta/thewest/resources/archives/eight/wklakota.htm. ↑ Edward S. Godfrey, "Cavalry Fire Discipline," Journal of the Military Service Institution of the United States 19 (1896): 259. ↑ 29.0 29.1 Josephy, Jr., Alvin M., Trudy Thomas, and Jeanne Eder. Wounded Knee: Lest We Forget. Billings, Montana: Buffalo Bill Historical Center, 1990. ↑ Ostler, Jeffrey. (2004) The Plains Sioux and U.S. Colonialism from Lewis and Clark to Wounded Knee. (p. 354). ↑ Congressional edition By United States. Congress, p. 132. 2011-04-26. http://books.google.com/books?id=NEBHAQAAIAAJ&pg=PA132&dq=plenty+horses#v=onepage&q=plenty%20horses&f=false. Retrieved 2011-08-17. ↑ "Lakota~WOUNDED KNEE: A Campaign to Rescind Medals: story, pictures and information". Footnote.com. http://www.footnote.com/page/1299_lakotawounded_knee_a_campaign_to/. Retrieved 2011-08-17. ↑ Doctor Sally Wagner Testifies At Wounded Knee Hearings Part Two. ↑ "U.S. Army Indian Wars, Medal of Honor citations". History.army.mil. http://www.history.army.mil/html/moh/indianwars.html. Retrieved 2011-08-17. ↑ Patti Smith Group, "Ghost Dance". On Easter, Arista AB 4171, released 1978. ↑ Robbie Robertson, "Ghost Dance", on Music for the Native Americans, Cema/Capitol 28295, 1994. ↑ Sam Roberts. "Sam Roberts - The Bootleg Saint Lyrics MetroLyrics". MetroLyrics. http://MetroLyrics.com/the-bootleg-saint-lyrics-sam-roberts.html. Retrieved 8 October 2013. ↑ "We Were All Wounded at Wounded Knee", Redbone's unofficial discography site, with lyrics. Webpage found 2010-03-31. ↑ Goldfarb, Andrew (21 December 2012). "The Evolution of BioShock Infinite". IGN. http://www.ign.com/articles/2012/12/21/the-evolution-of-bioshock-infinite. Retrieved 1 June 2013. ↑ Miller, Matt (9 April 2013). "Free Will And Hope In BioShock Infinite". Game Informer. http://www.gameinformer.com/b/features/archive/2013/04/09/free-will-and-hope-in-bioshock-infinite.aspx. Retrieved 1 June 2013. L. Frank Baum editorial that appeared in the Aberdeen (SD) Saturday Review on January 3, 1891, just five days after the massacre. The author wrote about those terrible "Redskins," his favorite word for Indians. He wrote, "The Pioneer has before declared that our only safety depends upon the total extermination of the Indians. Having wronged them for centuries we had better, in order to protect our civilization, follow it up by one or more wrong and wipe these untamed and untamable creatures from the face of the earth." Wikimedia Commons has media related to Battle of Wounded Knee.